Here's the gobsmacking truth: it IS possible to feel joy, peace and love all the time… or 99% of the time. Your true essence IS joy, peace and love. In fact, a growing number of teachers in various fields (from Bruce Lipton in molecular biology, to Anita Moorjani in spiritual teachings) say that we are meant to create and experience heaven on earth. But often times our lives are colored by a backdrop of anxiety, depression, pessimism, hopelessness, anger or pain. Sometimes they're a dull noise in the background. Sometimes they're intense. I know all too well that sometimes it’s scary to face them, and so you try pretending they’re not there. Sometimes they just consume you. None of this has to remain this way. Finding freedom and peace beyond all of these feelings (and the events that might have given rise to the feelings) is absolutely possible. I've done it and many people have done it through my wound-healing processes. Heal the wounds of the past, even the toughest traumas, finally feeling peace around painful memories. Resolve family and ancestral patterns that keep replaying in your life. Feel whole, and discover more space for peace and joy. Discover a deeper sense of love for yourself, others and life, which means you begin to show up differently in your life. I know what it's like to carry old wounds (you can read my story here) and I've done the work to heal them. It would be a privilege for me to support you in healing your heart. I don't do traditional therapy. In the kind of work I do, you won't have to rehash painful memories. Instead, I use tools (such as NLP - Neuro-Linguistic Programming, EFT - Emotional Freedom Technique, and hypnosis) that allow you to release the hurts and heal painful memories without having to relive them and rehash them. I can tell you more about how this all works in a complimentary Discovery Session. The Discovery Session is free of charge and it gives us an opportunity to get to know each other, to get deeper understanding of what it is you're dealing with and explore what working together will be like. I promise you'll emerge from the Discovery Session with the sense of hope and lightness that there IS a way for you to no longer be carrying this pain with you. 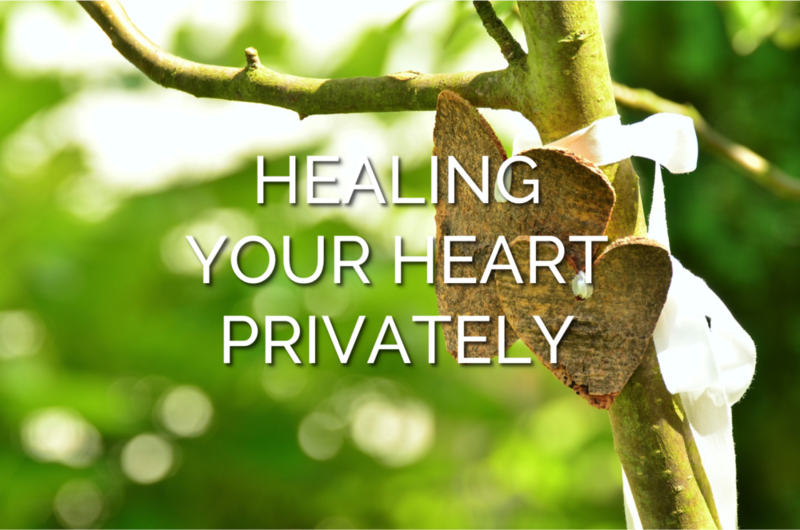 The other way in which we can do the deep work of healing your heart is by attending the Wholehearted retreat. The retreat is truly one of the most beautiful experiences you'll have; one where you not only get to emerge as a more whole version of yourself, but you also get to witness others do the same. The sweetness that emerges from this group is something that you'll rarely experience anywhere else. You can see all of the details of the retreat as well as whether there's an upcoming one on the retreat page. "From our very first session you helped me see that [all of this heaviness I've felt my whole life] is bigger than me. That this is not my stuff; it is inherited! It makes SO MUCH sense! And it's incredibly validating to know that I’m not making this up, and that I have in fact been dealing with it for a long time." “What a powerful healing journey. Thank you for including me in this weekend and supporting me along the way. So much has shifted for me and the ease and peace I’m feeling is empowering. A new man has entered my life. We had dinner together last night and he is such a sweet soul. Mutual nurturing all the way … I’m making dinner for us tonight. He asked if I would like him to build us a campfire in the yard. OMG. My drawing!! My vision is already becoming a reality. “The biggest impact of the workshop on my life is that it made me hopeful in a way that I haven’t in quite some time. The best part of the workshop was the writing exercises that helped you identify and drill down on feelings that you might not even be aware of having around incidents that you might not have previously considered to be fairly significant even though they may have stuck with you throughout your entire life from early childhood. Which was another thing I also enjoyed about the retreat, seeing how many of the things that other people were dealing with that stemmed from seeds planted at a very early age and knowing that I am not the only one. “The biggest impact on my life from the Mending Heart workshop is how much stronger I am emotionally and mentally. Morella skillfully walks you through steps in writing assignments that help you come to terms with what you’re at the retreat for. “If you have a hunch or slight inclination that you might benefit from this retreat, then I am confident you will! Morella has woven together multiple successful healing processes with years of experience and a lot of love to create this transformative experience. The emotional work coupled with the bodywork was positively beyond my expectation. I was so grateful for her presence, compassion and, more importantly, for the nudge to go deeper and really look at this wound from multiple angles. At this point, I can honestly say that I am forever changed for the best. I am now able to reflect upon my past hurt with new eyes and a sense of completion that I didn’t think was possible. In my opinion, if you are reading this, you should sign up today. I trust you won’t regret it."